Sergey Titov of Hammerpoint Interactive really likes the DayZ Origins guys. Don't be mislead by the name. DayZ Origins has no link whatsoever with Dean 'Rocket' Hall's zombie Arma mod; instead, claim its GamersPlatoon creators, it's inspired by Hall's "outstanding and powerful engine of Arma." These same creators also say they're "defiantly" looking forward to Arma III and the DayZ standalone, and that may or may not be a typo. Hokay, you know the drill: zombies have taken over the world, demanding low cost housing and cheap gas for their cars, or something along those lines. It's up to you to survive in a world gone mad, but fear not: the rich have squirreled away most of the really good stuff in their walled sanctuary, Salvation City. If you're very good, they might let you in, so you can spend some dough on their spiffy vehicles. There's also a levelling system, plenty of buildings to explore, a day/night mode, a patient zero zombie, and so on. There's no price tag, but there is a donations page, should you choose to support GamersPlatoon. The mod had its soft launch - probably beta testing by another name, though it seems anyone can download it - January 25th. 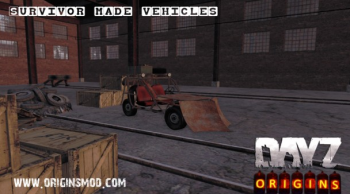 Though the game is "inspired and based on modified version of DayZ", according to its creators, it has no direct link with Hall's mod. Yes, even though it does use pretty much the same logo. It's a whole different thing, okay? However GamersPlatoon does have a friend in Sergey Titov, of Hammerpoint Interactive's The War Z fame; GamersPlatoon was offering The War Z beta keys back in October 2012. "We've watched the GamersPlatoon community grow over the last few months," said Titov at the time, "and we love how they support the core PC gaming community."